Ahhhh, a 3 day weekend! We didn’t have many plans, just to get caught up on things we’ve been saying we would get done and relax. Saturday night, while relaxing, zoE decided to come snuggle her sister. As soon as she got comfy half-way on my bump, our Milkshake put on a show. I lifted my shirt so the Hubs could watch, and zoE snuggled in even more. 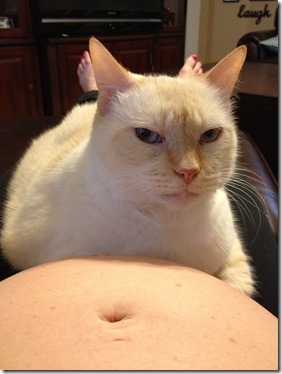 I really think the fur babies are starting to get excited about having a new sibling soon. I have been falling behind on my workouts and I don’t like it. I made sure to work out all three days over the weekend, and I think I have my workout groove back. I try to workout at least 5 days a week, and the past few weeks it’s only been 2 days (at best). This morning I snapped a picture of me doing some arm work with Logan adding a little extra weight to help with my legs. I hope everyone has a wonderful Memorial Day. Now, I need to finish my 3 day weekend to-do list. Look at you being all good and working out! Good job. great job on working out – will make it lot easier after she’s born. How’s your foot?